Lab recommendations on charcoal collection from sediment matrix are found below. When requesting for an estimate or quotation, please indicate in the form the following information – currency, service requested or turnaround time (standard, priority or time guide), the number of samples and the billing address. The AMS standard service reports results in 14 business days while the priority service takes 6 business days or less. Beta reports results in 2-3 business days for its AMS time guide service for charcoal. Water flotation is a common technique used to consolidate or separate charcoal from sediment matrix. There is little chance of actual contamination unless the water used for the flotation has petrochemicals in it or some highly organic suspension. If flotation is necessary, the lab recommends to (a) wear surgical gloves when performing the flotation, and (b) make sure to dry the material for 12-24 hours prior to shipping at temperatures not greater than 70°C. 3- Flotation followed by Dispersion then Differential Sieving – this can be used for charcoal fragments that are above 180 microns in size. 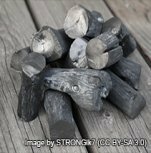 Charcoal that is less than 180 microns is sometimes referred to as “micro-charcoal” or more appropriately soot. Charred material that is <180 microns is problematic from the pretreatment side. The sample has a lot of surface area, and the alkali extractions used to remove humic acids many times cause the material to dissolve so that there is very little to date. There are some ways to isolate “carbon black” (sub soot sized particles) like that which is found in marine and lake cores, but it involves heavy liquids and the use of very strong acids like hydrofluoric acid. Beta Analytic does not do this as it is quite dangerous to work with HF.